Have you ever fancied being part of a real-life version of Being John Malkovich, without the danger of becoming trapped in a portal into the mind of an actor? This project helps you experience just that. In Sweden, a lot of discussion around connectivity tends to be negative, especially when it comes to controlling our exposure to media that can alter our outlook on our surroundings and the world. What if we made a campaign to show limitless connectivity in a way that changes our perspective? Striving to alter that negative viewpoint, they didn’t focus on anything as simple as nine devices all working at once, but rather went in a very different direction. The final outcome was an immersive online experience, allowing viewers the chance to ‘step inside the minds’ of nine Swedish celebrities, including actor Joel Kinnaman and our favourite Queen of – ahem! – shoddy robots, Simone Giertz. 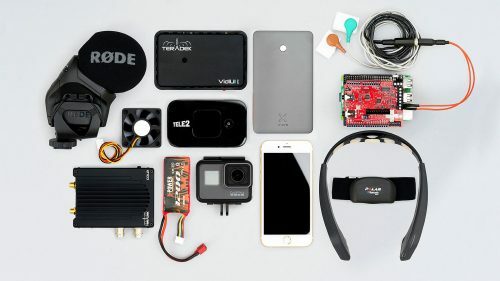 A custom backpack housed a 3D-printed rig to support a Raspberry Pi 3 for collection of sensor data, and a colour-grading box for footage recorded by a GoPro-equipped helmet. “Wait: did she just say ‘collection of sensor data’?” Yes. Yes, I did. 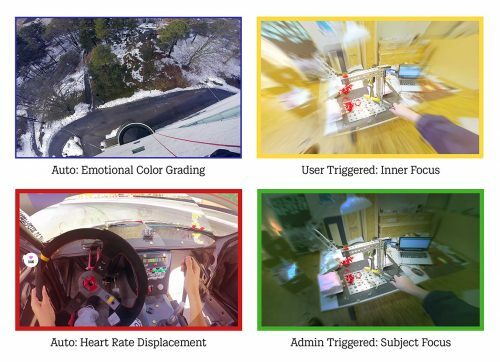 Along with the video and audio streams from the on-board GoPro and microphone, the system collected data on heart rate, emotional state, and even sweat. Delicious. The brain sensor data collected from the EEG then controls the colour of the footage as it’s relayed back to the audience: green for calm, yellow for happy, red for angry, and blue for sad. We can confirm that Simone’s screen turned a deep shade of purple on more than one occasion, and her heart rate actually shot up when she thought she had burned out some servos. Videos from the various participants can be viewed at the Tele2 YouTube channel, including Joel, Simone, entrepreneur Cristina Stenbeck, and altitude instructor Anna Lundh. Working with marketing agency Edelman Deportivo and digital studio Wolfmother Co., Your Majesty documented the impact of the campaign on Bēhance, so check it out. Wow this is so cool! I hope the RPi team will use this tech to create a new project in the resources tab. Thanks for sharing! Very cool! This shows the potential a Raspberry Pi has. This says live-stream, and I see they’re using a GoPro – how did they get the live video stream from the GoPro into the Rpi? Is there an HDMI capture in there somehow? What is it?